Wristbands with RFID chips that serve as your ticket for entry and your cashless payment method are all the rave these days… especially at raves (really music festivals, but I couldn’t help myself). Everybody knows that they look cool and let guests enjoy events without having to worry about carrying tickets and money. The qualitative feedback has been overwhelmingly positive but what do the numbers say? 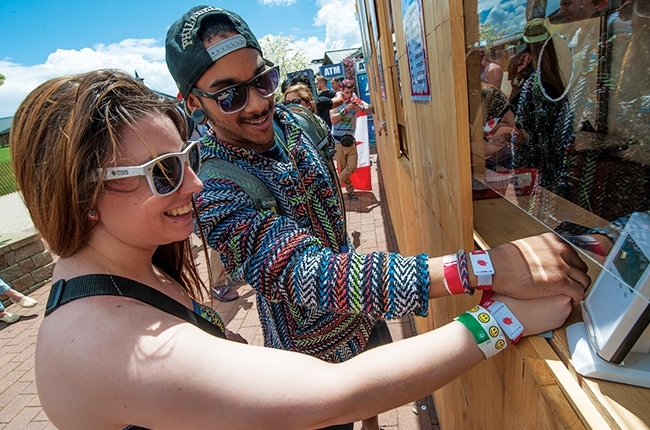 We recently wrote a blog post about Mysteryland’s use of the simple RFID technology. When we revisited the event to see how well it worked, we were impressed by their metrics. Guests spent double what they spend at comparable events. Double. And since these are comparable events, we know that the extra money isn’t coming from Mysteryland’s ticket sales. We’re talking about food, beverages, and merchandise from over 200 points of sale at the popular music festival. The vendors loved it. They were provided with instant sales reporting in far greater detail than they’d previously received in a cash environment. Jacob Smid, managing director of live events for the SFX, the company that runs Mysteryland, says that “cashless does provide us the ability to ensure that the product mix and production are in line with what the audience wants. If we sell 400 tofu wraps in the first couple hours and were expecting to sell 50, we can work with the vendors to adapt production and increase the vegetarian options for that edition of the festival.” Being able to adapt on the fly is a key component of successful event planning. #EventTech that allows #EventProfs to adapt more intelligently is a big part of why the event space is rapidly expanding. SFX has plans to implement the RFID technology at other events, including TomorrowWorld and the upcoming Austin City Limits Music Festival. The cashless takeover has begun. Comment or tweet @squadup to continue the conversation. I have to show my thanks to this writer for rescuing me from such a setting. Because of exploring throughout the world-wide-web and getting thoughts which were not powerful, I believed my entire life was done. Existing devoid of the answers to the difficulties you have resolved as a result of this short article is a critical case, and the kind which may have in a negative way damaged my career if I had not discovered your web site. Your good ability and kindness in controlling all the details was tremendous. I’m not sure what I would’ve done if I hadn’t encountered such a solution like this. It’s possible to at this moment look ahead to my future. Thanks very much for your reliable and effective help. I will not be reluctant to recommend your blog post to anybody who would like assistance on this situation. I’m so impressed about RFID technology !